The roots of football run deep in Long Beach, where Long Beach Polytechnic High School has produced more players who have played in the National Football League than any other high school in the United States. Poly's storied program has fed the NFL a wide variety of top players, including such receivers as Johnny Morris, Gene Washington, Tony Hill, Stephone Paige, Marcedes Lewis and DeSean Jackson. 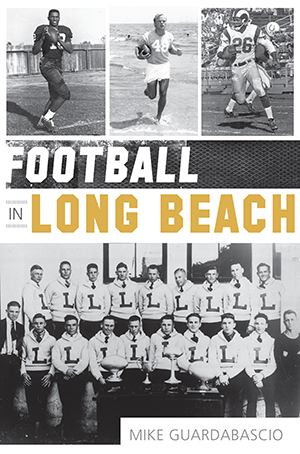 This authoritative citywide pigskin history by Mike Guardabascio includes the football sagas of other area high schools, as well as the legacies of Long Beach State and Long Beach City College, which have enjoyed their own brands of national recognition. Mike Guardabascio is the sports editor of Gazette Newspapers. He is the founder and former editor of LBPostSports.com, and he is the vice president of the Long Beach Century Club, a non-profit organization committed to supporting amateur athletics in the city of Long Beach.